In our new three part series, Roman local tour guide Carlotta Boldrini shares her expertise on touring Rome – by foot! Carlotta is a former ACIS Tour Manager and the current ACIS supervisor for tours to Italy and Greece. Passionate about her city, she especially likes to see it through the eyes of a foreigner, even better if a young student, and witness the emotions that her city inspires in a young, rising citizen of the world. In Part 2, Carlotta joins an ACIS group to explore more city icons, from the Sistine Chapel to the Colosseum. Catch up with Part 1 here. Today is a very busy day! In the morning we start at the Vatican. We’re actually taking a trip into a foreign state – did you know the Vatican is a separate country? We’ll see the Sistine Chapel, definitely the most densely decorated indoor space (and the most crowded indeed) in the world, with stories of the Old and New Testaments, the Creation of the World and the Human Family, and the Last Judgement, all by the great Michelangelo. As part of our visit, we can’t miss Saint Peter’s, the Church of the Pope, with so many statues and mosaics. It is gigantic, inside and out, and our guide tells us it is the largest church in the world. Its dome is so big that the Romans call it the Cupolone. Over the course of 4 hours we walk, learn, and take great pictures, but, afterward, we are in need of lunch and some rest – otherwise some of us are at risk of becoming pagan! Just around the Piazza San Pietro are a lot of small eateries where we are able to get a little food and drink. But then, the show must go on! It’s time to leave the centre of Christianity and head to the symbol of Imperial Rome, the place where gory games held the entire population spellbound back in days of old, the Colosseum. Gosh! Who could have thought it would be SO big? We go inside but do not have to be in the long lines because our Tour Manager has entrances reserved for us (thanks ACIS! ), and from there we climb up and down to see it all. We learn that the Romans really loved to spend entire days watching the fights between Gladiators, re-enactments of ancient battles, and fights against the most exotic animals: crocodiles, elephants, tigers and lions, bears, and boars. At the end of the show, the dead animals were cut off in pieces and given to the people as food to bring home. Imagine, you would spend the whole day there idling and gambling, drinking and shouting, and, if you were lucky enough, you could end up earning a hind leg of a giraffe to feed your family. This is what I call recycling! After the Colosseum, there is not really time today to venture through the Roman Forum, but we can use our tic kets another day. We’re now all willing to see Rome at a different pace: we want to eat gelato and shop, so we are going to go somewhere where we can see more history and have free time in the area. We make our way to the Via del Corso, the thoroughfare in the heart of Rome where you find cool stores, nice gelato places, souvenir stores and, eventually, other beautiful palaces and monuments. There is an array of different shops, for all pockets, and the area is pedestrian so we can walk around safely. We are all very happy to roam around for a while with friends before catching up with one another in one hour. At our meeting point, we head out on a walk toward the other big building left by the Ancient Romans, the Pantheon. On our way there, we pass through a quaint square where there is a church dedicated to Saint Ignatius. Our Tour Manager tells us to take a look up at the ceiling and notice the inner cupola: there is an eye-cheater (or trompe-l’oeil, if you fancy French better), which looks real…but it’s totally flat and painted! Artists call this foreshortening and the optical illusion is amazing. If our TM hadn’t told us, we wouldn’t have guessed the difference! We continue on our walk and just after a few steps along a narrow street, we arrive in a square full of people, with live music going on, a fountain surrounded by steps where people sit and rest, and opposite to it a gigantic brick-faced building that people line up to visit. You may want to call it the Parthenon, but the real name is The Pantheon – the most important Roman Temple dedicated to all the Olympian Gods. Our TM tells us a lot of history about this building and how it shows how confident, cosmopolitan and futuristic Rome was at the height of the empire. The building is truly gigantic, its height and width measuring over 130 ft, a cylindrical structure with a round vaulted ceiling so a perfect sphere could fit inside. For this reason the Romans call it affectionately La Rotonda, the round one. It looks like Romans give a nickname to almost everything! All of those columns are made from one single block of stone imported from Egypt, and it would take three men joining hands to round them. The building is still standing so well preserved because it was turned into a church and also became a burial place for the kings of Italy and important artists, including the painter Raphael. But, we must go inside because it is in there that we can understand how massive and mystical it is. ANDIAMO and let us see! A fisheye photo is the only way to frame it. The coolest part here is the ceiling with that opening onto the sky. After all of that history and activity, everyone is craving a gelato! There are at least two famous places just off the Pantheon square which have an amazing reputation. One is called Giolitti’s. The other spot is San Crispino and they are known for some more exotic or new flavour combinations like Cinnamon and Ginger, White Figs, and Chocolate Rum. We get to our pizza place (Italians call it a Pee – tzeh – ree – ah), and our TM tells us about a traditional pizza dinner: you always take a starter, a Bruschetta and then a pizza. It’s going to be a delicious way to end a spectacular day! Part 3 of an Ideal Walking Tour of Rome arrives next week! 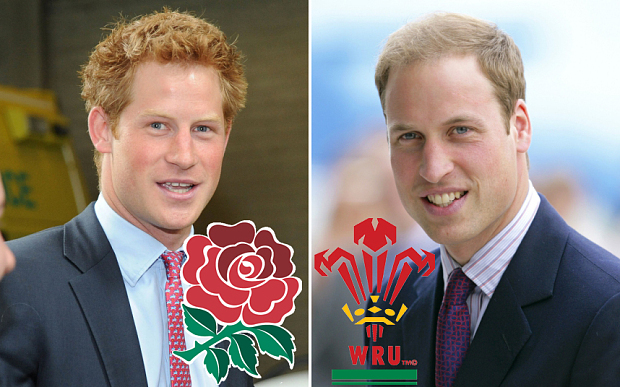 Why Do Prince William and Prince Harry Support Different Rugby Teams?